This is part 2k of the translation of my treatise Jesuspassagerna hos Josefus – en fallstudie into English. All surviving Greek manuscripts of Josephus’ Antiquities of the Jews contain the Testimonium in the wording that also Eusebius has; but all these manuscripts are late (11th century onwards). There is however a number of renderings of the Testimonium in works written in other languages ​​– thus translations made from the Greek – and some of these should be paid attention to in a treatise like this one. Among the earliest are the Latin translations. They can be said to be three in number. Rufinus of Aquileia translated Eusebius’ Ecclesiastical History into Latin in around the year 402 and then translated also the Testimonium. His version confirms the Testimonium in the normative version. A few years earlier did also Jerome translate the Testimonium, and since his work is founded on Eusebius’ Ecclesiastical History, it is likely that also his master for the Testimonium was Eusebius’ version. Jerome’s version of the Testimonium deviates primarily from the normative text by his version saying that Jesus only “was believed to be the Messiah.” An additional two decades earlier (during the 370’s) an unknown author known as Pseudo-Hegesippus summarizes the Testimonium very freely, and demonstrates thereby knowledge of the paragraph. What his master for the Testimonium looked like and which source he used, cannot be settled with certainty. Testimonium Flavianum is witnessed, although not quoted, in a Latin text which in medieval manuscripts goes by the name of De excidio urbis Hierosolymitanae (On the destruction of the city of Jerusalem). In some manuscripts the work is attributed to Bishop Ambrose of Milan (c. 340–397); in other to a Jewish convert named Isaac, who served in the Roman church policy in the 370’s. We actually do not know who wrote it. The name Pseudo-Hegesippus originates from the fact that the work sometime in the period from late fourth to early ninth century erroneously was assumed to have been written by Hegesippus, a Christian chronicler who lived about 110–180 CE. The mistake was probably due to the names Hegesippus and Josephus being so similar. The work is essentially a paraphrase of Josephus’ Jewish War and Josephus was often named Iosippus in Latin. The confusion may also have been due to the fact that it, like Hegesippus’ now lost work Memoirs (Ὑπομνήματα), consisted of five books. Inasmuch as the work previously was attributed to Hegesippus it has come to be known as Pseudo-Hegesippus. The work is usually dated to sometime in the period 370–375 CE. It is believed to have been written at the earliest in the 370’s since there seems to be a reference in the text (2:9, 5:15) to Count Theodosius’ reconquest of Britain which took place in the years 367–370, and it should therefore have been written after that event. It also refers to the triumphant position of the Roman empire (2:9, 5:46), and the description of the barbarian tribes on the border suggest that the author is not aware of Rome’s devastating defeat at Adrianople in present-day Turkey in the year 378 and the subsequent Germanic invasions, which in that case sets a upper limit at 378 CE. In a letter from the late fourth century, Jerome writes that the rumour that he “translated the books of Josephus” into Latin is false  Some interpret this as if Josephus thus would be translated into Latin, and also as a reference to Pseudo-Hegesippus’ “translation” and that the work thus was available in the late fourth century. Pseudo-Hegesippus’ writing is, however, no translation, not even a paraphrase, but should rather be regarded as an entirely new historical work. It is consistent with much of contemporary historiography, which often was plagiarism. Pseudo-Hegesippus chose however to be very free in regard to his sources, and is not afraid to reassess Josephus’ attitude towards the Jews and emphasize the Christian message. Without any doubt did the author consider himself to be a historian and he summarizes freely the works of others, where the framework consists of Josephus’ Jewish War augmented by other writers, particularly Virgil (70-19 BCE), Sallust (86-35 BC) and Cicero (106-43 BCE). There is a very free paraphrase of the Testimonium in book two, and this is often adduced as evidence that Pseudo-Hegesippus knew of a version of the Testimonium going back on a manuscript of Josephus that was independent of Eusebius, and that this manuscript also was lacking the expression “he was the Christ/Messiah.” If Pseudo-Hegesippus was not aware of Eusebius, he should accordingly rely on a version of the Testimonium which he had not received from him and therefore Eusebius scarcely could have invented the Testimonium. This line of argument however remains to be proven. It is in my opinion quite possible that Eusebius is the author of the Testimonium. And as Eusebius also is the first known person to cite and attribute the Testimonium to Josephus, Pseudo-Hegesippus’ testimony must evidently be closely examined; something that will be done in the following. 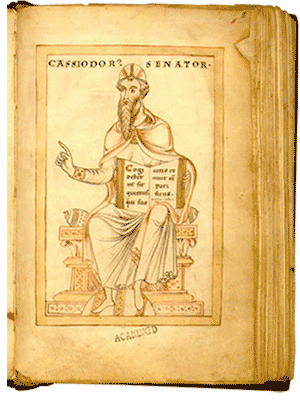 A drawing in brown, red and yellow, meant to represent Cassiodorus, in a manuscript of parchment from before 1176 CE. When in the West, in contrast to the East, an increasingly number of people went from Greek to Latin, a need to translate important Greek texts into Latin arose. It has been suggested that Pseudo-Hegesippus did not know Greek, since all the texts he uses, except Josephus (and possibly Eusebius), was in Latin. The one who was in charge of the translation of all the writings of Josephus from Greek into Latin was the Roman statesman and writer Cassiodorus (c. 485-c. 583). But apparently Josephus’ Jewish War was by then already translated into Latin. Cassiodorus says that the translation of the book into Latin, according to some was made ​​by Jerome (c. 347–420), according to others by Ambrose (340–397) and by still others by Rufinus (c. 345–410). Jerome writes (sometime around 385–398) that he at least has not translated the books of Josephus, as rumoured. This is sometimes interpreted as if the Jewish War already in the late fourth century was translated into Latin. Others assume that Jerome refers to Pseudo-Hegesippus’ free paraphrasing and still others that he instead denies that there is any translation and that nothing of Josephus therefore yet had been translated. In 395 CE, at the very earliest, but more likely in 402 or 403 did Rufinus of Aquileia translate Eusebius’ Ecclesiastical History into Latin; a very free translation with both deletions and additions. Rufinus’ translation is far from a literal translation. Furthermore, his work had an addition at the end covering the period from Eusebius up until Rufinus’ own time. He did however translate the Testimonium verbatim. Köln Dombibliothek, Codex 1035, from 1463 CE. 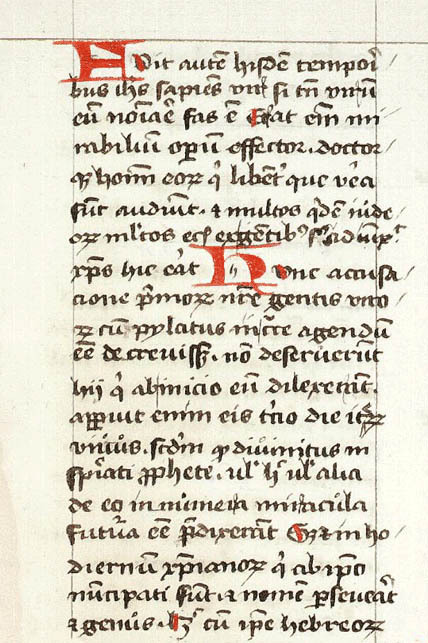 Part of folio 14r with the Testimonium Flavianum in Rufinus’ Latin translation. A little more than a century later, Cassiodorus (or rather his assistants) translated Josephus’ writings from Greek into Latin. The exception was the Jewish War, which already had been translated, perhaps by Rufinus or by someone else. But the Testimonium does not appear in that book. Cassiodorus thus made the first translation of the Antiquities of the Jews into Latin and was accordingly translating directly from the Greek. Eusebius, however, had already reproduced the Testimonium, the passage on James and the passage on John the Baptist. When Rufinus translated Eusebius into Latin, he of course also translated these three passages. When Cassiodorus then translated the Antiquities of the Jews into Latin, he used the Greek text of Josephus, except when it came to the three Christian passages, where he instead chose to copy the Latin text of Rufinus’ translation of Eusebius’ Ecclesiastical History. The reason for this may be as simple as laziness or convenience, yet there is reason to question whether Cassiodorus’ copies of Josephus lacked the Christian passages, as every translator – even if they are using an earlier translation as a template – usually like to give their translation its own profile, if only by slightly changing somewhat in the choice of words or the structure of the sentences. As previously said, some argue that Pseudo-Hegesippus did not know Greek, because all his sources apparently were Latin sources. Since there is no indication that Eusebius would have been translated into Latin before Rufinus made his translation in 402 CE, and if pseudo-Hegesippus (c. 375 CE) did not know Greek, he would accordingly not have been able to make a loose translation of Eusebius’ Greek version of the Testimonium into Latin. However, it is likely that Pseudo-Hegesippus really knew Greek. First of all there is no evidence that his main source, the Jewish War, was translated into Latin in the 370’s, although it is possible. Furthermore, if any of Jerome (who denies it), Ambrose or Rufinus had – as the rumours claimed in the time of Cassiodorus (mid 6th century) – translated the work; it is doubtful whether they would have had it completed in the early 370’s because of their relatively young age at the time. The one who is commonly pointed out as the translator of the Jewish War into Latin is Rufinus, and by c. 370 he was hardly older than 25 years. It is therefore unlikely that Pseudo-Hegesippus had access to a Latin translation of the Jewish War. Moreover, Pseudo-Hegesippus’ work appears to be just a free paraphrase/translation, perhaps made ​​by someone who was not too knowledgeable in Greek. To make doubly sure, Pseudo-Hegesippus is also aware of other passages than the Testimonium in Josephus’ Antiquities of the Jews; passages which Eusebius did not refer to in his Ecclesiastical History. Thus, Pseudo-Hegesippus was reasonably familiar with the Antiquities of the Jews and there is no evidence whatever that this work would have been in a Latin translation in the 370’s. Taking this into consideration, while at the same time acknowledging that Cassiodorus himself confirms that he in the sixth century is the first one to translate the book into Latin, it seems very likely that Pseudo-Hegesippus actually had at least a basic knowledge of the Greek language. To summarize: If now Pseudo-Hegesippus relied on the Antiquities of the Jews, it means that he actually knew Greek, although not necessarily perfect Greek. It is though impossible to determine from where he paraphrased the Testimonium. However, it is reasonable to assume that pseudo-Hegesippus’ master (whichever it was) had the Testimonium in Greek and not in a Latin translation, since we have no evidence that either Josephus’ Antiquities of the Jews or Eusebius’ Ecclesiastical History was translated into Latin by the time of Pseudo-Hegesippus. There was simply no Latin version of the Testimonium available when Pseudo-Hegesippus wrote his work. Since Pseudo-Hegesippus principally relies on the Jewish War, which, in contrast to the Antiquities of the Jews does not contain anything about Jesus, it is possible that his edition of the Jewish War contained an interpolated version of the Testimonium. We know that at least later in time the Testimonium was also attached to the Jewish War. Another possibility is that the Greek manuscript of the Antiquities of the Jews that Pseudo-Hegesippus likely utilized actually contained the Testimonium. This would be no sensation even if Eusebius was the creator of the Testimonium in the very beginning of the fourth century, because at the time when Pseudo-Hegesippus wrote, at least 60 years had elapsed since Eusebius for the first time reproduced the paragraph. A third scenario is that Pseudo-Hegesippus was relying directly on Eusebius’ Ecclesiastical History. The possibility that Pseudo-Hegesippus has taken the Testimonium from Eusebius is also supported by the fact that the paragraph about Jesus (2:12) is inserted by Pseudo-Hegesippus long after he has told 1) about Pilate setting up imperial effigies in Jerusalem (Antiquities of the Jews, AJ, 2:3, the same event that is told of just before the Testimonium), 2) about Paulina, who is seduced in the Isis temple (AJ 2:4, right after the Testimonium and not occurring in the Jewish War) 3) and about Pilate’s assault on the Samaritans (AJ 2:5, the second following paragraph after that in the Antiquities of the Jews). If Pseudo-Hegesippus would have taken the Testimonium from the Antiquities of the Jews, the reasonable place to introduce the paragraph would be in connection with these other stories (AJ 2:3–2:5). This, however, is not the case. Pseudo-Hegesippus may therefore very well be using Eusebius as his template for the Testimonium. Jay Raskin has noted the structural similarities between the way Pseudo-Hegesippus and Eusebius are thinking, in the context where they both reproduce the Testimonium. Just before Eusebius quotes the Testimonium both in Demonstratio Evangelica and in Theophania, he argues that the Jews should believe in “the good and miraculous things about Jesus”, because the apostles for the sake of truth also told the negative things about Jesus; and the Jews have no problem believing in all the negative. Right after Eusebius having reproduced the Testimonium in his Ecclesiastical History, he calls attention to the fact that there is no excuse left for those who by forging scriptures speak ill of Jesus “since an historian, who is one of the Hebrews themselves, has recorded in his work these things concerning John the Baptist and our Saviour”; that is spoken good of him. On these three occasions Eusebius thus highlights that a) the Jews and other skeptics actually should believe in the good and miraculous things that are told about Jesus for the sake of truth, because the Apostles also reported things that were unfavourable to Jesus, also they for the sake of truth, and b) because Josephus, one of the Jews himself, said favourable things about Jesus, there is no reason for skeptics to talk bad about Jesus. Eusebius writes this in direct connection to all the three times he quotes the Testimonium. These three passages, and above all the text set in bold type, should be compared to Pseudo-Hegesippus, who claims that “if the Jews do not believe us, they might believe one of their own”, one “who spoke the truth about” Jesus, and that although “he did not believe even his own words … he spoke for the sake of fidelity to history, because he thought it wrong to deceive”. Raskin argues that Pseudo-Hegesippus perhaps was familiar with all the three books where Eusebius reproduces the Testimonium and that his arguments were influenced by this. As can be seen the line of thought is similar in both Eusebius and Pseudo-Hegesippus when they are dealing with the Testimonium, that is to say that Josephus chose to reveal the truth about Jesus for the sake of truth, and that the skeptics therefore also in the interests of truth should not speak ill of Jesus. To this a further observation can be added, namely that the brief mention that Eusebius makes of John the Baptist in Ecclesiastical History immediately after the Testimonium (quoted in blue above) also has its parallel in a reference to John the Baptist made by Pseudo-Hegesippus right after he has summarized the Testimonium: “John the Baptist a holy man, who never placed the truth of salvation in second place, had been killed before the death of Jesus.” This suggests that Pseudo-Hegesippus after all was relying on Eusebius and in a way treats Jesus and John in the same order as Eusebius – by mentioning John again and this time after he has mentioned Jesus. Because of the very free nature of Pseudo-Hegesippus’ work, nothing is safe to say other than to suggest that Pseudo-Hegesippus probably knew Greek, but maybe not perfect Greek because whenever he had the opportunity he used Latin sources. He therefore easily could have incorporated the Testimonium from a copy of one of Eusebius’ works. But he may all the same very well have used the Antiquities of the Jews also for the quote of the Testimonium, provided that it was found in the manuscript he had access to. This still does not prove a witnessing of the Testimonium independent of Eusebius, because at the time when Pseudo-Hegesippus wrote, 60–70 years had passed since Eusebius first quoted the Testimonium, and accordingly there were ample time for the Testimonium to find its way into the copy which Pseudo-Hegesippus in this case relied on. Compare the text of Pseudo-Hegesippus above with the text in the Testimonium Flavianum below. Those parts above that are set in the red are in my opinion, reasonably equivalent to the parts of the Testimonium that are set in red below. The parts that are set in green in the Testimonium below are those parts that Alice Whealey argues are missing in Pseudo-Hegesippus, but which I think also is present there, and these parts are also marked in green above. The blue-marked parts in Pseudo-Hegesippus, contain statements that Josephus was not a believing Christian. As can be seen, Pseudo-Hegesippus has not made a literal translation. It is hardly even a matter of paraphrasing, but rather a kind of collage. The Testimonium is therefore scattered and woven into other trains of thought. Alice Whealey is arguing that if “he was the Messiah” would have been part of the copy which Pseudo-Hegesippus relied upon, he would never have failed to include the phrase, especially as he takes every opportunity to emphasize the supremacy of Christianity over Judaism. The parts that are set in green in the Testimonium are the parts that Whealey claims are absent in Pseudo-Hegesippus’ account. But I think that she is wrong and that they certainly are there. The parts that I refer to have been highlighted in green also in Pseudo-Hegesippus above. First and foremost, in the case of Pilate’s condemnation, Pseudo-Hegesippus writes: “even the leading men of the synagogue who delivered him up to death”. This is really close to what is written in the Testimonium: “And when Pilate, because of an accusation made by the leading/principal men among us, condemned him to the cross”. The highlighted brown parts are partially verbatim in the Testimonium and Pseudo-Hegesippus. Only Pilate, not the deliverance has been omitted. But Pilate’s offense occurs earlier in Pseudo-Hegesippus, by the statement that when Jews had brought Jesus “to Pilatus to be killed, they began to press the reluctant judge. In which however Pilatus is not absolved [non excusator Pilatus]” This in all likelihood refers to precisely the part in the Testimonium where “Pilate, because of an accusation made by the leading men among us, condemned him to the cross”, and thus Pilate is not absolved. In both cases, it is said that the Jews by bringing pressure on Pilate is able to make him kill Jesus. Apparently, also this part of the Testimonium is found in Pseudo-Hegesippus, although – as is usual when it comes to him – thoroughly rehashed. Acknowledged his divinity. If this assumption is correct, it would mean that only “he was the Messiah” was excluded from Pseudo-Hegesippus’ version of the Testimonium. But is even this the case? Ken Olson has proposed a solution that is much more plausible than an omission of “he was the Christ” in Pseudo-Hegesippus’ master, namely that it after all is there, but rather in the form of “acknowledged his divinity”. This is how Alice Whealey translates the passage in question: ”even the leading men of the synagogue who delivered him up to death acknowledged him to be God”. We have to ask ourselves: From where in Josephus has Pseudo-Hegesippus got the information that the leading Jews would have regarded Jesus as God? This is fundamentally a quite bizarre statement if Josephus would have written it. Josephus of course was a devout Jew and thus must have known that the leading Jews could not possibly consider Jesus to be God! While a statement in the Testimonium that Jesus vas the Messiah is missing, at the same time there is this strange and seemingly baseless statement in Pseudo-Hegesippus, that Jesus was acknowledged as God by the leading Jews. 1) The Latin deum fatebantur, which Whealey translates into “acknowledged him to be God”, can also be translated as “acknowledged his divinity”. Heinz Schreckenberg, for example, translates the passage to “confessed his divinity”. The verb fatebantur is the past tense of fateor, which means to confess, admit, acknowledge, own, show or indicate. The noun deum means god and deity. And to claim that Jesus was the Messiah is very close to acknowledge his divinity if you are a committed Christian. 2) Is it then possible to translate the Greek ἐνδείξει (endeixei = accusation) into the Latin fatebantur (acknowledged)? There seems to be a big difference in meaning between accusing someone and acknowledging (or confessing) someone. The Greek ἔνδειξις means primarily “a pointing out” and thus “an accusation”, “a laying information against” somebody. But the word has also the meaning of “a demonstration”, “display of one’s good will”. This latter interpretation is not that far from “acknowledge” or “confess” in the meaning of “considering that someone is”. 3) This is also supported by the fact that Pseudo-Hegesippus everywhere else does not translate, or even paraphrase, but many times just gives his own interpretation of how he believes the history should be portrayed. When combined with a misinterpretation of the Greek in such a way that it was the principal men among the Jews who saw Jesus as the Messiah, it is entirely logical and feasible that the Testimonium, in exactly the wording that was in Eusebius’ Ecclesiastical History, also was in Pseudo-Hegesippus’ master, whatever it was. One should remember that the manuscripts at that time were written in uncial script, which means entirely in capital letters, while there often were no gaps between words, sentences or even phrases, and the line could break in the middle of a word. CONSEQUENTLYITCOUL-DLOOKLIKETHISTHENEWSENTENCEBEGUNWITHOUTAPRECEEDINGDOT. 4) The fact that the phrase “the principal men” (Greek: ”πρώτων ἀνδρῶν” or prôtôn andrôn) occurs soon after “he was the Christ”, and not like Pilate, at the end of the sentence (or in a sentence further away), makes it likely that the connection erroneously was made by Pseudo-Hegesippus. It is a seductive circumstance that it was the principal or leading men who acknowledged his divinity, and the term “the principal men” is just adjacent to “he was the Messiah” in the Testimonium (ὁ χριστὸς οὗτος ἦν καὶ αὐτὸν ἐνδείξει τῶν πρώτων ἀνδρῶν). It is a seductive circumstance since “he was the Messiah” is the only component of the Testimonium missing in Pseudo-Hegesippus’ rehash of the paragraph. The likelihood that all this would happen by chance seems to be small. Since the Latin deum can be translated into deity meaning divinity and the Greek ”endeixei” be interpreted as “a demonstration”; since Pseudo-Hegesippus’ text is a very free paraphrase, and the expression ”the principal men” follows closely upon “he was the Messiah” in the Testimonium – Pseudo-Hegesippus’ assertion “that even the leading men … acknowledged his divinity” seems to be taken directly from the Testimonium, albeit modified in a more Christian course so that Jesus was rather divine than anointed. In that case, this would be fully consistent with Pseudo-Hegesippus’ efforts to reinterpret Josephus in a more Christian direction, where Jesus being divine reasonably is of more value than him being the Messiah. The parts of Pseudo-Hegesippus’ Testimonium that are set in blue above, says that Josephus himself was not a believing Christian, but despite this he did not deny the testimony. Since Pseudo-Hegesippus, according to my explanation, apparently misread the Greek, and thought that Josephus had written that the principal men of the synagogue believed that the man who was brought to Pilate was the Messiah and therefore divine, or that they perhaps accused him of being the Messiah, it is entirely reasonable that Pseudo-Hegesippus did not consider Josephus to be a Christian. Pseudo-Hegesippus would then have interpreted the text so that Josephus himself did no claim that Jesus was the Messiah. And an objection that the Testimonium must have contained other things, such as a denial by Josephus that made Pseudo-Hegesippus think that Josephus was not a Christian, is far-fetched; because Pseudo-Hegesippus apparently has everything else in the Testimonium in front of him. In the Testimonium it is among other things called into question whether Jesus was a human being and it is said that the prophets had foretold his future life, all oblique identifications of Jesus as the Messiah. This was apparently still not enough for Pseudo-Hegesippus to interpret Josephus as a Christian. But this is of course an accurate observation made by Pseudo-Hegesippus, as beside the Testimonium there is not a trace in Josephus which would indicate that he was a Christian. To sum it all up; Pseudo-Hegesippus’ master probably had all the components of the normative version of the Testimonium. Because of his free interpretation, it is impossible to determine the exact wording of the manuscript he had access to. Inasmuch as Pseudo-Hegesippus’ main source is Josephus’ oldest historical work, the Jewish War, it cannot be ruled out that there was an interpolated version of the Testimonium in his manuscript of the Jewish War. But there is also the possibility that he has taken the Testimonium from Eusebius, either directly or indirectly from someone else who in turn was relying on Eusebius. Finally, it is quite possible that Pseudo-Hegesippus found the Testimonium in Josephus’ Antiquities of the Jews (and then likely in Greek), because at times he seems to use information that can only be found there. If that is the case, it would still be no sensation if Pseudo-Hegesippus had found the Testimonium in the manuscript of the Antiquities of the Jews which he had access to. By then almost seven decades had elapsed since the passage was first witnessed, which leaves plenty of time for Eusebius’ version of the Testimonium (the one he composed or simply reproduced) to be interpolated into the various manuscripts spread around the vast Roman Empire, although not necessarily in all or even most manuscripts. This Isaac is mentioned by Jerome in Commentarii in Epistulas, Ad Titum 3:9. Albert A. Bell JR, Josephus and Pseudo-Hegesippus; in Louis H. Feldman, Gōhei Hata, Josephus, Judaism and Christianity, Detroit 1987, p. 350. Marian Hillar, Flavius Josephus and His Testimony Concerning the Historical Jesus, 2005, p. 18. Heinz Schreckenberg, Kurt Schubert, Jewish Historiography and Iconography in Early and Medieval Christianity (Compendia Rerum Iudaicarum Ad Novum Testamentum) p. 76. “That it is used directly from Josephus is confirmed by the Pseudo-Hegesippus using also the reference concerning the deceived Roman matron, Pauline, which follows the Jesus passage in Antiquities (Bk. XVIII.9.4; De excidio Bk. II. 4). He also makes reference to the passage on John the Baptist though the interpretation of his death is that found in the Gospels – as a punishment for admonishing Herod for his marriage to Herodias (Antiquities Bk. XVIII.5.2; De excidio Bk. II.12.2).” (Marian Hillar, Flavius Josephus and His Testimony Concerning the Historical Jesus, 2005, p. 17). Earl Doherty, Jesus: Neither God Nor Man – The Case for a Mythical Jesus (2009), p. 548–549. Compare the Antiquities of the Jews 18:5:2 to Pseudo-Hegesippus 2:12:2. Eusebius, Theophania 5:43; Demonstratio evangelica 3:5. Alice Whealey, Josephus on Jesus, The Testimonium Flavianum Controversy from Late Antiquity to Modern Times, 2003, p. 32. For what it’s worth, I think that Josephus only goes as far back as Pseudo-Hegesippus’s original source. I suspect that the Jewish Wars is a mixture of the Aramaic notes of the real historical first century Josephus and Justus or some other source (for how did Josephus know what was going on behind the walls of Jerusalem) developed by a Christian editor (probably Polycarp) in 147 CE (i.e. on the seventy seventh anniversary of the destruction of the temple). I think the Testimonium is original to the composition but unknown to the historical Josephus. In other words, the work was developed by a Christian and was modified by Eusebius into something more like what a Jew might have written in the first century. I am on the fence whether or not the Testimonium only goes back to Eusebius or to the time before him. I do not think that the Testimonium in any form was written by Josephus, since it does not fit in the context. However, it is a quite difficult issue and when it comes to the Slavonic Josephus it becomes even more complicated. I have previously never heard of the solution you are suggesting here, although I have read some of your theories. Have you elaborated on this theory somewhere? I once started an extensive side by side comparison of Pseudo-Hegesippus (the Latin translation associated with Ambrose) and the Greek text of Jewish War at freeratio.org. There are some surprises that come out of that. Yeah, that was “an extensive side by side comparison”. I believe it is this one: Did Our Josephan Corpus Begin as a Christian Forgery Only to be ‘Corrected’ Later? It will probably take me the whole night just to read it, not to mention to digest it.